Joseph Henry (1797–1878) married his cousin Harriet Alexander (1808–1882) in 1820. They had four children: William A. Henry (1832–1862), Mary Henry (1834–1903), Helen Henry (1836–1912), and Caroline Henry (1839–1920). When the Smithsonian Institution Building, or Castle, was completed in 1855, the Henry family lived in apartments at the east end until Henry's death in 1878. 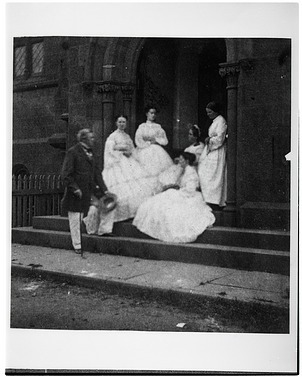 Secretary Joseph Henry (1846-1878) with his wife Harriet and three daughters, Caroline, Mary and Helen, standing in the east doorway to the Smithsonian Institution Building, c. 1862. Henry was the first Secretary of the Smithsonian, and he and his family resided in the east wing of the Smithsonian Institution Building, 1862, by Unknown, photographic print, courtesy Smithsonian Institution Archives, Record Unit 95, Box 12, Folder: 3, SA-203 or sa-203. 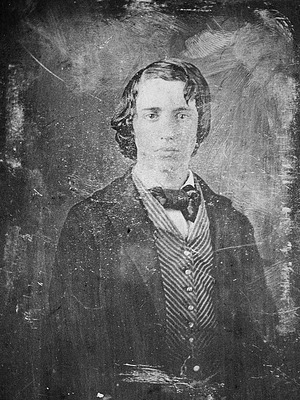 Possibly William Alexander Henry (1832-1862) son of Harriet and Joseph Henry (1797-1878), physicist and first Secretary of the Smithsonian Institution from 1846 to 1878, c. 1855, by Unknown, photographic print, courtesy Smithsonian Institution Archives, Record Unit 95, Box 12, Folder: 3, 82-3190. 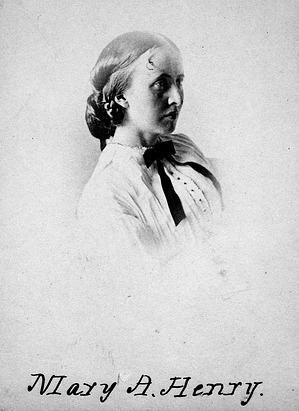 One of the three daughters of Harriet Alexander and Joseph Henry, physicist and first Secretary of the Smithsonian Institution from 1846 to 1878. 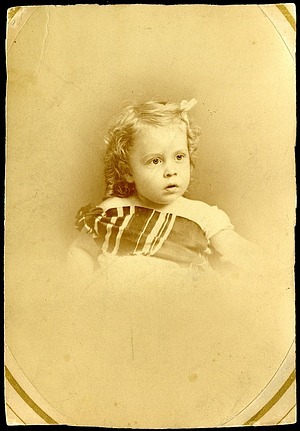 The Henrys had one son, William Alexander, born 1831, and three daughters, Mary Anna, born 1834, Helen Louisa, born 1836, and Caroline, born 1839, c. 1830s, by Unknown, card photograph, courtesy of Smithsonian Institution Archives, Record Unit 95, Box 27C, SIA2012-7652 or 36792 or 2004-10351. 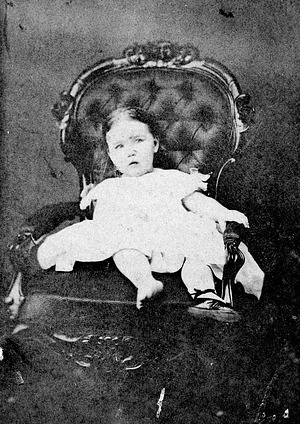 Portrait of Joseph Henry's daughter Caroline (1839-1920) as a child sitting on an ornate chair. Joseph Henry (1797-1878), physicist, was the first Secretary of the Smithsonian Institution from 1846 to 1878, c. 1842, by J. Good, carte de visite, courtesy Smithsonian Institution Archives, Record Unit 95, Box 81, 82-3257. 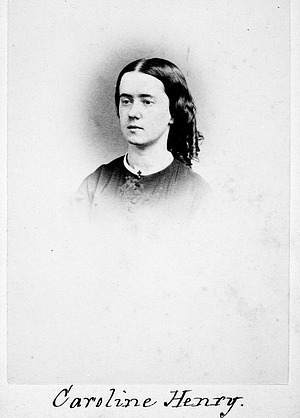 Photographic portrait of Mary Anna Henry, daughter of first Smithsonian Secretary Joseph Henry (1846-1878), c. 1855, by Unknown, photographic print, courtesy Smithsonian Institution Archives, Record Unit 95, Box 12, Folder: 5, 82-3258. Portrait of Helen Louisa Henry (1836-1912), daughter of Harriet Alexander Henry and Joseph Henry. Joseph Henry (1797-1878), was a physicist and the first Secretary of the Smithsonian Institution from 1846 to 1878. 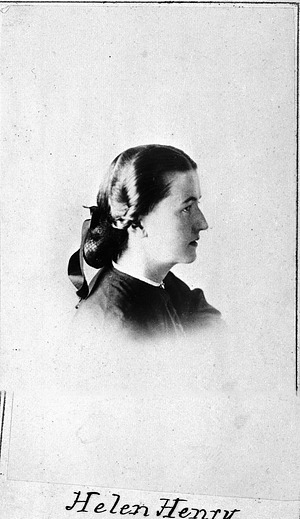 This photograph is a profile of Helen's face, c. 1855, by Alexander Gardner, photographic print, courtesy Smithsonian Institution Archives, Record Unit 95, Box 81, 46638-H or MAH-46638H. Joseph Henry's daughter Caroline (1839-1920). Joseph Henry (1797-1878), was a physicist and the first Secretary of the Smithsonian Institution from 1846 to 1878, c. 1855, by R. W. Addis, carte de visite, courtesy of Smithsonian Institution Archives, Record Unit 95, Box 81, 82-3254. 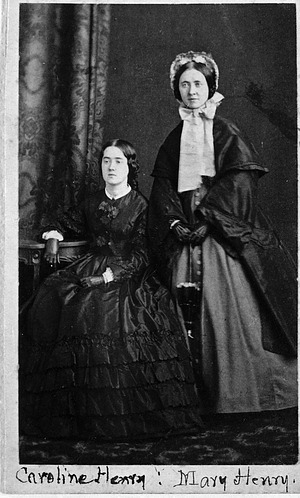 Joseph Henry's daughters Caroline (1839-1920) & Mary (1834-1903). Joseph Henry (1797-1878) was a physicist and the first Secretary of the Smithsonian Institution from 1846 to 1878. This photograph shows Caroline seated, resting her arm on a table, and Mary standing to her right, c. 1855, by Unknown, carte de visite, courtesy Smithsonian Institution Archives, Record Unit 95, Box 81, 46638-G or MAH-46638G. 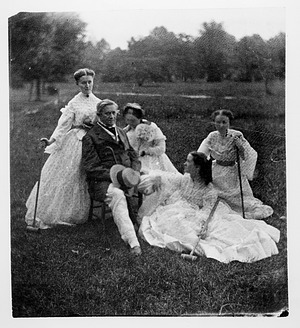 Joseph Henry, first Secretary of the Smithsonian Institution (1846-1878), and his wife, Harriet Alexander Henry, and their daughters Caroline, Helen and Mary, who are holding croquet mallets, seated on the grounds of the Smithsonian Institution Building, 1865, by Titian Ramsay Peale, photographic print, courtesy Smithsonian Institution Archives, Record Unit 95, Box 12, Folder: 3, 2002-12181. Joseph and Harriet Henry's Monument at Oak Hill Cemetery, Washington, DC, 2005, by Paul S, digital image.